Delighting in God and each other: Young Stanthorpe parishioners welcome the newly formed St Joseph’s Catholic Girls’ Club. IT’S not all about make-up and trendy clothes. 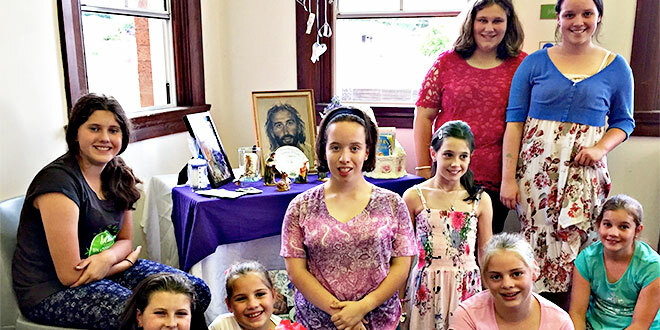 Young ladies in St Joseph’s Parish, Stanthorpe, in Toowoomba diocese, have collaborated to form a Catholic girls’ club for 10 to 17-year-olds. A group of girls began meeting in September as participants in the Girl Talk program, written by Brisbane Catholics Kym Keady and Chantale Wilson, for Real Talk Australia. Following the eight-week group study, it was obvious to organiser Selina Venier that on-going faith-sharing was not only relevant but also highly regarded by the girls and their families. “There’s such energy and enthusiasm about faith, when the girls get together,” Ms Venier said. Stanthorpe parish priest Fr Brian Connolly allocated a space for the club to continue to gather. “We are grateful to Fr Brian for his validation and support of this initiative,” Ms Venier said. “The girls were very excited to make the space their own and have delighted in filling it with colour. “It’s lovely to have somewhere they can ‘just be’ … they can talk, pray, read, join in shared activities. The club meets weekly on Friday afternoons. The girls’ time together is partly social but mostly faith-based. As a mix of students from St Joseph’s High School, the local state high school and home-schoolers, they have particularly enjoyed learning more about the teachings in the Catechism of the Catholic Church and “both the simplicity and complexity of the lives of the saints”, Ms Venier said. Club members hope to dedicate the group to the patronage of a particular saint but the girls “can’t decide which saint”. “There are about four saints who the group are constantly talking about and it’s hard to make a decision about which saint to choose. We might have to leave that to Fr Brian,” Ms Venier said. As part of their time together the group members are given the creative tools to form an extended opportunity for prayer. During Advent, club members took part in a retreat where a time of adoration was scheduled. Visiting seminarian Nathan Webb shared his story of faith at the retreat, and Lauren Yuile, a parishioner who had moved to Sydney for university, did the same. “I’m delighted to see how God continues to work, in so many ways, in the lives of the girls involved,” Ms Venier said. “They inspire me to hold onto the joy of faith … especially in their excitement to be with other young people who love God and are happy to express that love.